Did You Know? Caring for Your Child’s Teeth Starts at Birth! Maintaining healthy teeth and gums is key for overall health at every age, but during February we turn our attention to children and teens. Your child’s teeth are meant to last a lifetime, and a healthy smile is important to a child’s self esteem. With proper care, a balanced diet and regular dental visits, their teeth can remain healthy and strong. • Begin cleaning your baby’s mouth during the first few days after birth by wiping the gums with a clean, moist gauze pad or washcloth. As soon as teeth appear, decay can occur. A baby’s front four teeth usually push through the gums at about 6 months of age, although some children don’t have their first tooth until 12 or 14 months. • Until you’re comfortable that your child can brush on his or her own, continue to brush your child’s teeth twice a day with a child-size toothbrush and a pea-sized amount of fluoride toothpaste. When your child has two teeth that touch, you should begin flossing their teeth daily. • For children younger than 3 years, caregivers should begin brushing children’s teeth as soon as they begin to come into the mouth by using fluoride toothpaste in an amount no more than a smear or the size of a grain of rice. Brush teeth thoroughly twice per day (morning and night) or as directed by a dentist or physician. Supervise children’s brushing to ensure that they use of the appropriate amount of toothpaste. • For children 3 to 6 years of age, use a pea-sized amount of fluoride toothpaste. Brush teeth thoroughly twice per day (morning and night) or as directed by a dentist or physician. 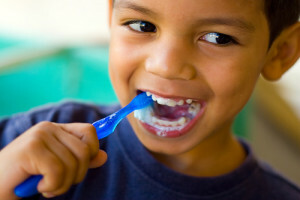 Supervise children’s brushing and remind them not to swallow the toothpaste. As children grow from toddlers to teens, Glen Oaks can advise you and them on dental issues like sealants, braces, wisdom teeth, the dangers of soda, the importance of mouthguards and the dangers of oral piercings. From birth through the teenage years, Glen Oaks Dental will provide quality dental care in caring manner, and will work with you as a team to provide a great dental experience for your child. Contact us today for an appointment!